Well, it's official. After skirting by on the occasional diet for the last 4 years, I finally had to break down and join a gym. Let me just be clear on the fact that I loathe the gym. Really excersise in general just isn't for me. The fact that this new 'hobby' is cutting into my cooking time and energy is just the cherry on the debbie-downer sundae. Needles to say, this week i've been all about the one pot wonders that I can make the fastest. This is just barely a recipe, but even if I cheated on most of the ingredients, I wanted to share because it turned out delicious and the leftovers also made a great lunch. You can always grill your own chicken for this, but Trader Joe's BBQ Chicken Teriyaki (microwaveable!) became a favorite of mine while I was moving and I haven't grown tired of it just yet! Prepare the noodles, chicken, and snow peas as directed on the package. Meanwhile, heat sesame oil in a large wok or skillet over medium heat. Add the carrots and saute until slightly soft. Add the cabbage to the pan, stirring often, and saute until wilted. 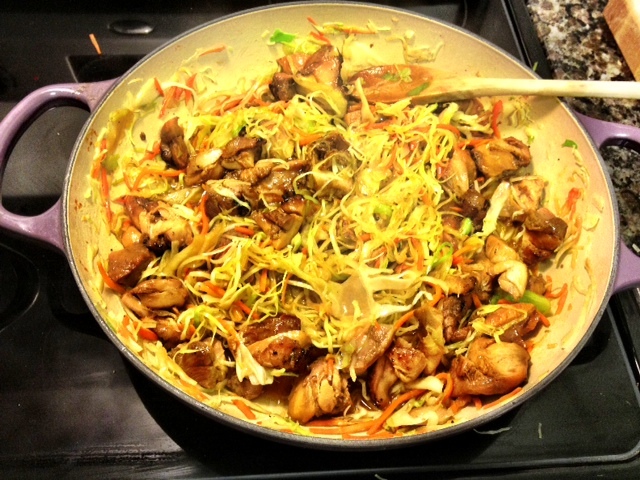 When the rest of the ingredients are done, add them to the pan with soy sauce. Stir well to combine. Enjoy!